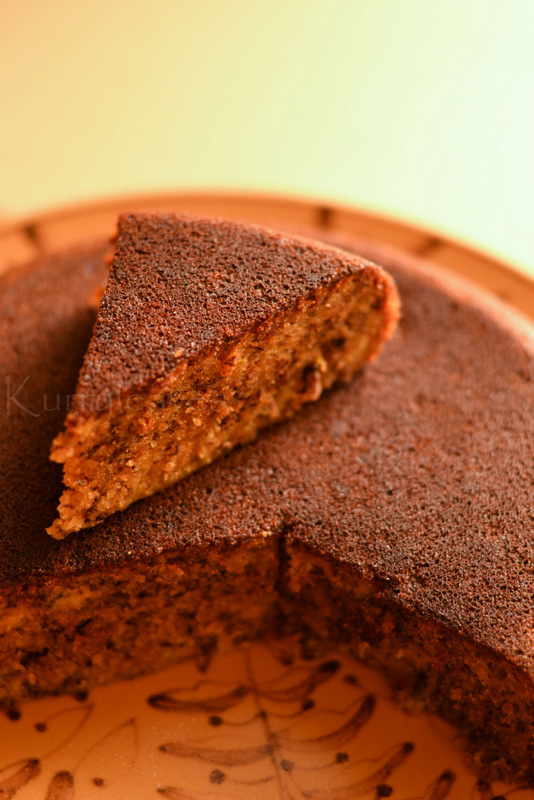 Learn how to make a Perfect Banana cake using rice cooker. Recipe Source: Everybody eats well in Flanders,You can find the original recipe here. Prep Time: 10 minutes . In a mixing bowl,mash the bananas using a fork.Keep aside until required. In a mixing bowl,combine together sugar,vegetable oil ( or butter) and vanilla extract.Add the eggs ,mix well using a whisk or a fork, until well combined. Now add the mashed bananas . Mix well until combined.In another mixing bowl combine together all purpose flour,baking powder,baking soda and salt using a fork. Add this to the banana mixture and gently mix until combined. Pour the batter into a lightly grease rice cooker pot.Press cook and let it cook for about 60 minutes or until a skewer inserted into the cake comes out clean. Allow it to cool slightly before turning it onto a plate. I used a 1.5 ltr push lever type rice cooker with a non- stick pot. The cooking time depends upon the type / volume of the rice cooker you use.So the cooking time can be anywhere between 45 to 80 minutes. Do not open the rice cooker too often to check for doneness,as this may affect the cooking time.Make sure you do not open the rice cooker for at least the first 30 minutes of cooking. beautiful click. love the warm tone. The cake luk super delicious.Can this cake be made in pressure cooker. If yes can to tell me the cookin time. I am sure you can bake this cake in a pressure cooker,i tmay take almost 40 to 50 minutes ,but i haven't tried it though. Check the recipe for' Pressure cooker vanilla cake ' to get details about baking in a pressure cooker. alternately, you can also steam the cake for about 45 minutes using a steamer . I like the way u described using the rice cooker with tips. Superb. Made two of'em 1 in a pressure cooker and the other in a Microwave. Was good to experiment with both.